The Infamous Auto Stop Propane Fill Valve. We live full time in a 1987 32′ Rockwood in New England, starting in November 2011 so Propane is near and dear to our hearts. As we revived and grudgingly updated the quarter century old systems we danced around the 100 pound propane tank and its original fill valve. The only other place that I had seen these is on the VW type II Westfalia campers. Finally we couldn’t fill the tank again. Couldn’t find anyone willing to touch the tank. So we took the least intrusive route and disassembled the Auto Stop Valve and replaced the o-rings. We bought Viton o-rings because that what stands up best to halogenated cutting oils and the like. Never considered that propane boils at -40F. Buna-N is the material of choice because it works well with propane and stays resilient down to -40F. But we managed to keep most of a tank of propane and that was enough to allow me to order a modern 1-1/4 inch ACME thread double check fill valve and a 10% outage or bleed valve for the 80% fill line. The solution is a lot easier than dealing with this early attempt at a solution without a problem. In the long run the only use that I can imagine for this Autostop valve is to allow operator-free propane tank filling. This is the valve from hell. It has a serious design problem, but in good condition it will work as advertised. Other than good condition? This is the Auto Stop from the vent side, On the left is the 1-1/4 inch Acme connection for the fill and on the right the 1 inch pipe thread that screws into the tank. 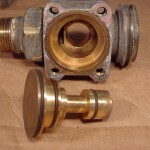 The shiny brass thing in the center is the single check valve. This is the valve that should be holding the propane in the tank when the outage valve is closed. 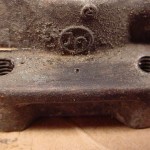 I’ve removed the top plate from the valve body. On the left is the pigtail of pipe that connects to the outage port. On the right is the outage exhaust to atmosphere. Here we are looking inside the top plate. On the left is the pigtail which connects directly to the 80% full port on the tank. This line carries tank pressure at all times. Here is a slightly closer look at the bottom or inside of the AutoStop top plate. The hole on the left connects directly to the propane tank through the pigtail. The hole in the center is closed by the outage valve or with the outage valve open communicates to the exhaust port on the right. 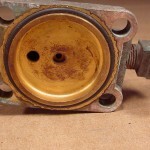 This is the top of the brass AutoStop valve body. When the outage valve is closed this chamber is in direct communication with the propane tank through the pigtail of tubing at all times. This is the valve body with the spool valve removed. The small end is the button you push if the propane isn’t flowing fast enough and the large diameter contains the o-ring that seals the propane in the top cavity between the top plate and the top of the spool valve at tank pressure. Here is where the first sign of trouble comes from. 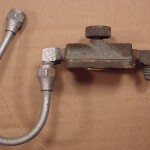 This is the weep or bleed hole between the top and middle o-rings. If the top o-ring leaks propane will escape through this hole. 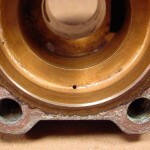 Underneath the flange that holds the top cap onto the valve body we see the other side of the weep hole. If propane is coming out here there is no way to stop the leak until the tank is empty. The valve must be repaired or replaced. The solution to the AutoStop problem is to replace this valve with two new valves, an industry standard double check fill valve and a 10% outage or bleed valve at the 80% fill line on your tank. This is the new valve that you need to fix your problem. 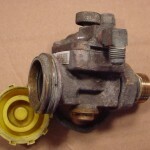 This valve is a direct replacement for the AutoStop Valve. 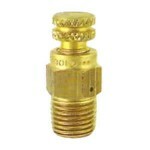 Equipped with 1-3/4″ Acme filling connection and 3/4″ NPT thread. It has a high filling capacity and a one piece body. 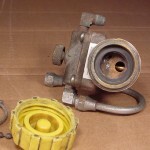 This valve is used primarily for filling ASME fuel containers. Filling rate is approximately 20 GPM with a 10 pound differential. 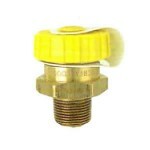 Valve comes with a cap with a plastic retaining strap. 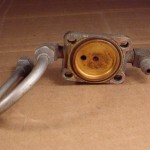 This is the most common fill valve. 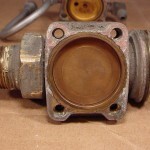 This is the other new valve that you need too fix your problem. This valve is a direct replacement for the AutoStop Valve connection to the port on your ASME tank at the 80% full level. For containers where mounting is to be done at the maximum allowable filling level. Has No. 54 drill size orifice. Much smaller than the outage vent the AutoStop valve requires for proper operation. In some jurisdictions state regulations require that this work be done by a certified propane technician. Having these parts on hand may make it easier for your certified technician because for his day to day work these are not a high replacement item and would not be a stock item. 21 Responses to The Infamous Auto Stop Propane Fill Valve. I need the details for the two valves pictured above. My auto stop valve died on me. The issue is the o-ring which is allowing gas to escape from the weep/bleed hole. I’d like to take your recommendation to get the larger intake valve and the smaller 80% valve. Can you give me the details (name, part numbers, where I can order them, etc.)? Thank you for your help. I’m not certified to do any more than post my opinions and what I’ve done. You need to find a propane technician willing to do the work for you. I’ve given the specifications for the fill and vent valves and pictures of the replacement parts, People qualified to perform this up-grade will be able to source the necessary parts and materials. Good luck. I know how it feels to watch your fuel gas float away on the breeze. Propanewarehouse.com sells these 2 items. I am not certified either, but I can Google stuff. Yeah Howard. Google or Duck Duck Go is our friend giving us access to more information with great ease. Is there a delicate way to tell people to RTFM? With most things I find there is a certain minimum amount of reading to be done before proceeding and I spend a great deal of time trying not to be painfully blunt with people about their shortcomings. Thank you for your comment. The best way is to have a propane certified plumber do the job. If you feel that you can do it yourself you can find a new industry standard fill valve and a 10% Outage valve through suppliers on the internet without too much trouble. The Autostop valve is a good design only in that it stops filling when the tank reaches the full line. It has one o-ring only keeping your propane from the outside world, that o-ring fails you lose your fuel. The new fill valves are double check valves so you get that additional safety factor. Good luck, Art. Thank you so much for posting this information. I was thrilled when I found out someone had the same issue. So… I will get the new fill valve and install it. Where my confusion lies and question is… Am I reusing this existing valve somehow? Where do i connect my outage port to? Do you think I could just replace the 3 “O” rings on the inside valve stem?? Peter, check with your local regulations before doing this work yourself but, once you disconnect the small vent line, the Auto Stop valve unscrews from the tank. Follow the vent line to where it goes into the tank and you’ll see where to put the new outage valve. You’re local plumber should be able to help you out. Your local Manchester tank dealer can also help you buy a replacement tank, and maybe you can fit a larger tank under your Vanagon. 3 gallons is about 12 pounds and the DOT cylinder for your BBQ grill is 20 pounds. doesn’t leak.. but cant get propane to go in..
You really can’t blame the RV service center. They’re a little gun shy because of the type of people they normally deal with so if it ain’t new they don’t want to touch it. Same for propane dealers. Given a large enough number of used tanks, one of them is going to fail. So they insist on selling new tanks whenever they have to deal with older equipment. As you’ve learned, the AutoStop can be made to work but it’s better for all concerned to replace it with new fill and outage valves. And keep your tank rust free, clean and painted. I’ve e-mailed you directly Earl and Betty. Just reply to that e-mail. Hey Art, I gather from the information provided that the new bleeder valve will screw into where the old vent line connected to the tank from the old auto stop valve. Do you mean that one must drill a no.54 drill bit into this area to make this new piece fit in? Could you just confirm that to clear up my confusion. Thanks for your time. The new outage valve has that small hole built in. Just use the yellow tape or pipe dope on the threads. Is there a video somewhere showing the replacement procedure? 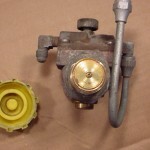 Mine isn’t leaking, but the release button is a pain and not many propane fill personnel know about this old valve. So replacing the old valves with the new valves would make life a little easier. No. no video, but it’s a straightforward procedure. I think I’m having the same problem with my 1988 fleetwood. My propane won’t fill. The gas shoots out the bottom through the auto stop.? My valve looks like it’s the same on you have on your site. Looking for suggestions. Feel free to email me too. The AutoStop valve is a dancing bear, the bear dances but not well. Changing over to the standard valve is an easy solution. If you don’t feel comfortable doing it yourself a friendly propane repairman can do it for you. Make sure you check with the rules in your state before you remove the autostop and go to a straight filler valve and bleeder. Most states have adopted NFPA54 & NFPA58. Having a autostop is a DOT requirement for all RV tanks and is not optional. E-Bay and Amazon are my go-to places. Don’t forget to buy the correct pipe dope or teflon tape for use with Propane.